A retired teacher presents a wacky tale of a birthday surprise gone wrong. Minter, who was an elementary teacher, has always had a passion for teaching children. Now retired, she continues to reach out to children through her writing. Filled with vibrant illustrations, Ollie’s Unlucky Day will entertain young readers and teach them valuable lessons on friendship, forgiveness, and more. 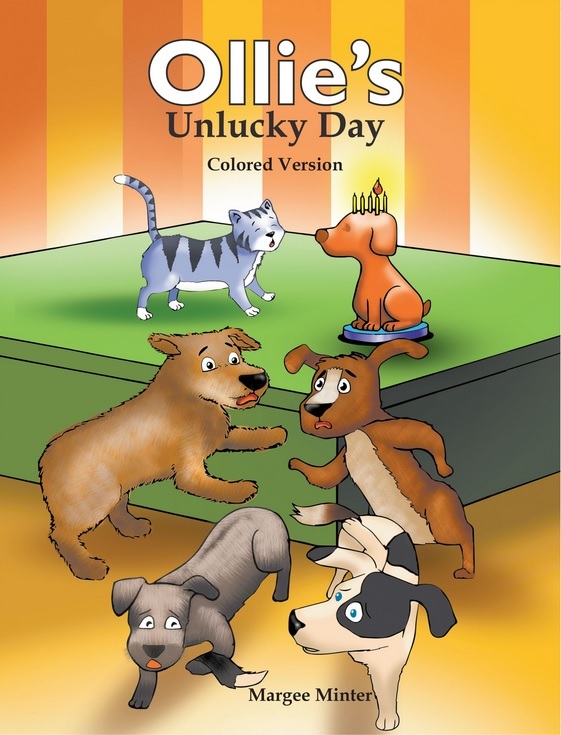 One dog receives a birthday surprise that he will always remember in Margee Minter’s illustrated book, “Ollie’s Unlucky Day (Colored Version).” “Ollie’s Unlucky Day” tells the story of Ollie, the dog, who is about to celebrate his fifth birthday. Ollie’s mom, Mrs. Yorkie, plans an unforgettable celebration for him. She organizes a party, inviting his doggy friends, but Mrs. Yorkie neglects to invite Ollie’s longtime friend, Lucky, the cat. Minter, who was an elementary teacher, has always had a passion for teaching children. Now retired, she continues to reach out to children through her writing. Filled with vibrant illustrations, “Ollie’s Unlucky Day” will entertain young readers and teach them valuable lessons on friendship, forgiveness, and more. Ollie’s silly birthday story is also available in a coloring book version and in Spanish. The book was featured in three international book fairs this year: the London Book Fair, BookExpo America, and the Frankfurt Book Fair. Book copies are available at www.litfirepublishing.com, www.amazon.com, www.barnesandnoble.com, and other online retailers. Margee Minter had served as a teacher in elementary school for thirty-four years. She graduated with a bachelor’s degree in elementary education at the University of Oklahoma. Now retired, she spends most of her time in Minter Ranch near Wynnewood, Oklahoma, with her husband and pets, a labrador retriever, two cats, and a herd of Angus cattle.